Years ago, chicken wings were not very desirable and were pretty inexpensive. Sometimes they were even discarded, or used to make stock or soups. At some point in the 1980’s, bars and restaurants started putting wings on their menu as appetizers, and people loved them! So much so, some chefs created a dinner plate of just chicken wings…. and the chicken wing craze began. Today, we all know of restaurant chains that specialize just in wings. Super bowl weekend is the most popular time of the year for wings. In fact, over one billion wings will be consumed on that day!! After all, it’s the second largest eating day after Thanksgiving. The market price on wings typically starts to rise by the end of the year, and spikes by late January right before the big game when the demand is at it’s highest. A few years ago, there was actually a wing shortage, due to low production. Don’t wait till game day to buy your wings; your local shop may be out of stock! Also look for your wings to be medium to large size, make sure they are not off color or bloody. I always figure about 25 wings for 10 people as an appetizer. There are three parts to the chicken wing: the drumette or (mini drumstick) the flat, and the tip. The drumette attaches the wing the body and has more meat than the flat. The tips, don’t really have any meat, yet are great for making stock or soups. One of the most popular recipes for wings is Buffalo Chicken Wings, which originated in Buffalo N.Y. These wings are deep fried, then smothered in vinegary cayenne pepper sauce and butter. Served along side are celery sticks and dipping sauce, usually ranch or blue cheese. My grilled wings are always a huge hit at my house for the big game. A couple of my favorite recipes are; Weber’s Sweet and Spicy Chicken Wings with Sriracha, Honey, and Lime. 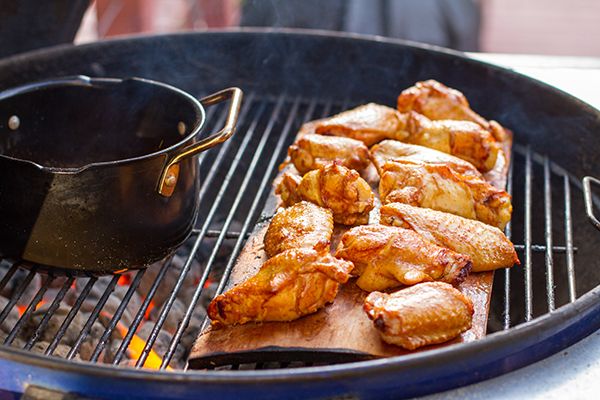 As well as Cedar-Planked Chicken Wings. 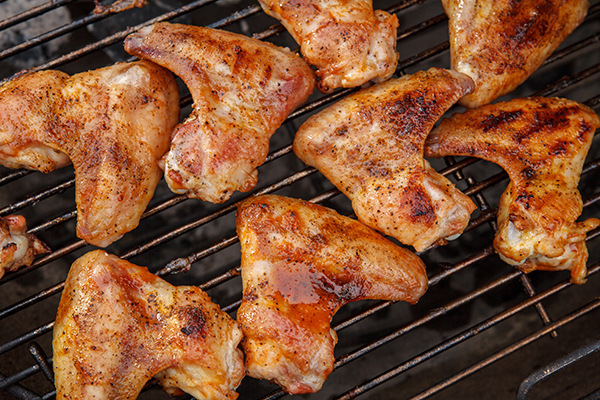 However you grill your wings for the big game, I’m sure they will be a huge hit!! !